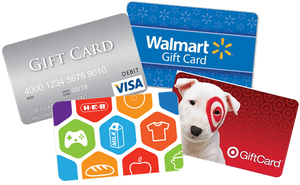 Gift cards, in any amount, from stores like Wal-Mart, HEB, and Target are always welcome! We distribute these cards to our families to help purchase clothing for children who are new placements and home supplies like laundry detergent, toilet paper, etc. These cards can also be used by Giocosa to purchase gifts for Christmas, adoptions and birthdays for the foster children in our care. General gift cards from VISA, Mastercard & AMEX are also always welcome!